There's lots of snow in my backyard, the skis are out, and I've already been listening to Christmas music since November 1st. (yes, I'm one of "those" people.) My annual holiday gift guide has always been one of my most popular stories, and this year I have chosen my family's favourite winter hobby as the theme. Skiing! Ski Discount Cards - Didn't jump on seasons passes this year? No problem. Put an RCR Rockies Card in each family member's stocking and you'll be able to afford multiple ski days on the slopes this winter. Each card costs $99.95 and includes three free days of skiing at four awesome resorts including Nakiska Ski Area, Calgary's closest resort. And for creative gift wrapping, wrap the discount card in a pair of ski socks or a new pair of gloves. A New Thermos for the Day Lodge - Save money on over-priced hot chocolate and coffee at the ski hill by bringing your own thermos with you. You can also bring a hot lunch for the kids in a fun themed food thermos. 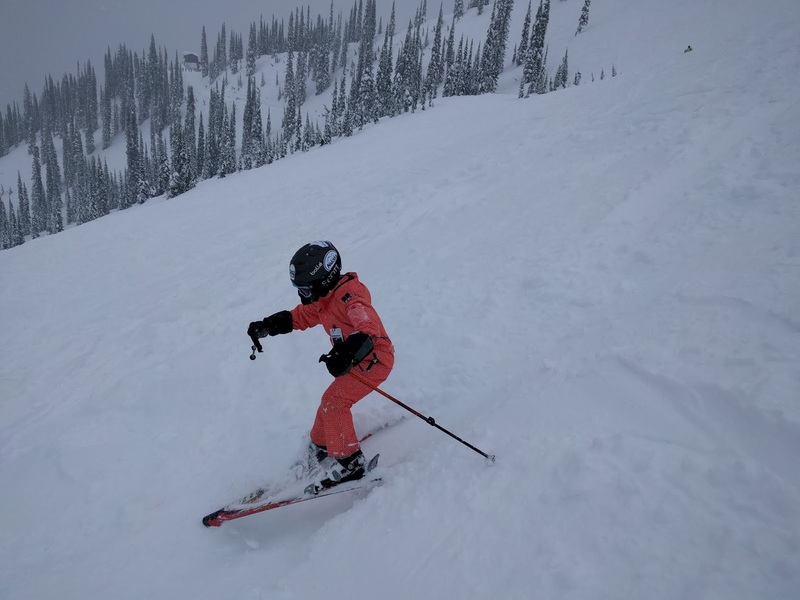 And if the kids need new ski boots, I suggest checking out the adjustable Roces Ski Boots from All Out Kids Gear, Affiliate Partner. A New Ski Helmet - Kids grow. Helmets get too small. Upgrade to a newer helmet this Christmas and protect those noggins. New Ski Goggles - My son will be getting a new pair of ski goggles this Christmas because I just realized that he's been wearing his current ones since he was 2 or 3 years old. (He's now 8!) Helmet-goggle gap is a "thing" apparently, and so you'll want to make sure your child has a cool pair of goggles to fit his or her helmet. Two Way Radios for the Hill - Have you ever lost a kid on a ski hill? Or a spouse even? I have, and it's terrifying! With two way radios, you can ski worry-free, even if your little shredder accidentally gets ahead of you and takes a wrong turn. Note that this section contains affiliate links to Amazon.ca. Follow the links, shop from their website, and I might earn a few dollars to put towards those new skis my husband wants. AND, scroll to the bottom of this gift guide to ENTER TO WIN two day passes for Nakiska Ski Area. 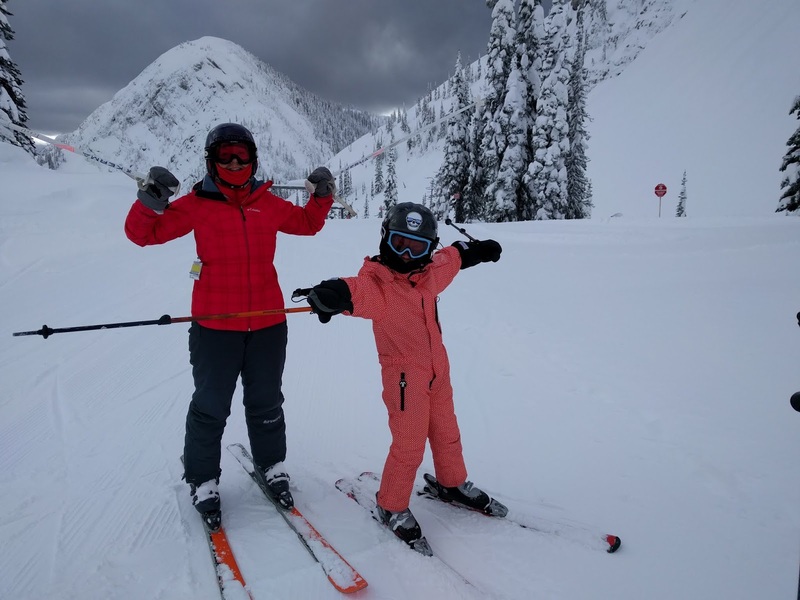 Ski Passes for your Local Nordic Centre - I'm thrilled that I actually have a seasons pass for the Canmore Nordic Centre this winter, and I plan to get out a LOT mid-week when my son is at school. A New Thermos for the Trails - Invest in a vacuum insulated thermos (as already mentioned for downhill gift ideas) and bring tea or hot chocolate with you on the trail to stay warm. And then of course there are the kids, who just won't stop growing!! And you might be buying new boots to go with the skis. A Pair of Adjustable Trekking Poles for the Kids - I grew tired of constantly having to buy my son new poles every year or two (for both cross country and downhill skiing.) So last year we just bought him some adjustable trekking poles and he uses one pair of poles for everything!! Brilliant, right? AND if you scroll to the bottom of this gift guide, you can ENTER TO WIN a pair of Black Diamond "Kids' First Strike" adjustable trekking poles from Canadian company All Out Kids Gear. Ski Socks - Can you ever have enough ski socks? And check out these cute Kids' Wintersport Smart Wool Socks. Ski Gloves - Skiing is fun when hands are warm. And hands will be toasty in these awesome Kombi Yolo Big Kids' Mittens. And note, my son has never had cold hands when wearing Kombi mitts or gloves. It's an amazing brand and the company knows all about warmth! A New Toque or Beanie - I am absolutely in love with these North Face Youth Pom Pom Beanies. And I'm a firm believer that you can never ever have too many different toques or knit hats to match every different winter jacket in your closet. A New Set of Long Underwear for the Kids - Again, kids grow, and chances are they won't fit last year's base layers anymore. (I know my son doesn't.) Upgrade to this Burton Youth Mini Fleece Set and the kids will be toasty warm on the slopes or trails. Fun granola bars - the expensive ones or flavours that you never buy because they don't come in bulk from Costco. Ski Wax - There's always a new and better ski wax for cross country skiing. Take my suggestions and browse to find what works for you. There are dozens of different products available for ski tuning, waxing, carrying and strapping skis, or caring for your skis. And by ordering off of Amazon, I "might" receive a few dollars as an Affiliate partner. Follow this link to browse a giant list of other Ski Books off Amazon.ca. And, if you're looking for some great ski-themed children's books, check out a few of these Ski Books for Kids off of Amazon.ca. And, check out this Skiing Coloring Book ! As mentioned already, if you buy a book or two here off of Amazon, I "might" make a few dollars to order a few for my family too. A favourite ski map, dry mounted - My son LOVES ski maps. He would love a giant map on his bedroom wall for his favourite ski resort. Ski Wall Art Decals for the House - And I personally love this Choose Your Destiny decal. And again, these contain links to Amazon.ca. Browse around if you want and support my affiliate efforts. - Contest closes on November 21st. A winner will be notified by the 22nd. If I don't hear from the winner by the 24th, I will choose a new winner. - Contest is open to all entrants age 18+. You must be able to visit the Nakiska Ski Area this winter, 2017-2018 season. - The giveaway is valid for two adult lift passes. They will be mailed to the winner, or can be picked up at the Calgary RCR office. - Contest is open to all Canadian Residents age 18+. - Contest is open to all residents of Canada and the USA age 18+. Check out these other Holiday Gift Guides and Giveaways!! What wonderful gift ideas and giveaways. Any of them would be welcome. Great gift ideas. And so true about the fancy and fun granola bars not coming in bulk at Costco! Ha! I couldn't find a way to edit the comment, anyway I love your stocking stuffers! Never thought of those!!!! Our fave trail is probably Heart Creek, there's no whining there as kids can jump in the stream all the way! What is your favourite family hiking trail? We really enjoyed exploring Lake O'Hara the past summer. Great family place to explore. Love and highly recommend them! Good for many ears especially with 3 boys. What snowy adventures do you have planned for your family this winter? Lots of skiing! Looking forward to getting my kids outfitted and ready for many winter adventures together. Great suggestions! We are also doing new goggles as gifts--I realized my kids have had theirs since toddlerhood too! What is your favourite thing to do outside in winter as a family? I think skiing is at the top of our list. We are hyped for my office's annual trip to Panorama, fave hiking trail is probably Bow Valley Ranch - so convenient for a quick visit! This year we are going to get into snowshoeing. And my kids love sledding more than anything else. Great ideas here! We winter bike, ski, sled, and sit at cozy fireplaces. And I love the ducksday winter suit in the pictures.. we have one for our youngest and the eldest is jealous. We love to ski at Nakiska! I love watching the kids get stronger and braver. We love hiking Ptarmigan Cirque! We want to spend lots of time skiing and cross country skiing at confederation park, the mountains and hopefully a trip to fernie! We can't wait to get our two kids out - so we are looking to the first ski trip of the season. Wherever! As a family, Ptarmigan Cirque is our fav! We have sledding, skating and xcskiing planned! Our favourite outdoor activity is sledding. We will be skating, skiing, snowshoeing, and tobogganning in our backyard! We're actually planning an adventure to the mountains to take Christmas photos in a couple weeks. We haven't been "snow people" in the past, but I think this might be the year. This summer our 4 year old rocked Ptarmigan Cirque - which was really exciting and makes it our new favourite family hike! Our snowy family adventures this winter include a ski weekend at Panorama, xcountry, skating and fat biking at Nipika, Santa Claus parade in Banff and lots of tobaganning! We love snowshoeing in the Sierra! Following Altitude Sports in Instagram! We love to go sliding in the winter! we have lots of sliding and skating trips planned! Our favorite thing to do outside in sliding!!! As far as snow adventures go, nothing planned just yet. Our family favorite is a ski trip that includes a hotel stay with a waterslide. We try to get out to locally every weekend but we aim for one hotel stay at either Fernie or Golden a year. The kids think a waterslide after a ski day is about the most perfect day. We love a good family day at troll falls. This is kids first successful hike and we try to do it a few times a year. It's a great moral booster for all of us. My daughter loved her intro to xcountry skiing through school last winter. The kids would probably say their funnest times outside in the winter are sledding on the local toboggan hill and skating on the outdoor pond. We love to go sledding outside in the winter!! SO MUCH FUN!! We are hoping to go snowshoeing this year as a family and I cannot wait! We have so many awesome trails that stay open year round in Wisconsin! I can't wait to get to the mountains to ski! Always full of good ideas Tanya!! Thank you! We like the hiking trails around Natural Bridge, KY. I have a little one so we won't be out in the winter too much this year. We like hiking in Prince Albert National Park. We are going to do some winter hiking and exploring adventures. Our favourite winter activities are hiking and building snow forts. Favourite hiking trail so far was Grotto Canyon. Favourite outdoor activity in winter is sledding! Snowy adventures - I hope there are many! Skiing, sledding, hiking - maybe even an adventure with Tanya and family if we are lucky!! We are most looking forward to a cross country ski trip to Lake Louise again this year, but also trying to figure out a weekend to try the kids out on downhill skis and still deciding on what hill to try them on. We love Johnson Canyon in the mountains and in town we love Waterfall Valley since it is just around the corner from our place. We hope to get up to Edmonton for the winter festival this year, there will be cross country ski trips to the mountains for weekends and some of the winter festivals. We love to cross country ski as a family and it is definitely our favourite winter activity. Now that our youngest is a little older and stronger we also hope to get more winter hikes in as well. We are going to try to snowshoe with the kids for the first time! We're just getting into hiking as family so we don't have a favourite trail yet but I can't wait to try out some of the suggestions here next summer. As for winter, we've got two mini-adventures planned - staying near Fernie and trying our first time at a hostel in the winter! I really love to cross-country ski and this winter we'll get out as family on the trails as much as we can. Thanks for this list, a lot of good stuff in here! We're most looking forward to our trip to Fernie this year! We're not huge hikers, we do more hiking. But we do quite a bit of snowshoeing around Calgary during the winter. I’m looking forward to a trip to Kicking Horse Mountain this year. A snowy adventure we are planning is to get out snow shoeing a lot more. We also have passes to Canmore Nordic so we plan on spending a lot of time xc skiing. Our favourite thing to do outside as a family is a day of skiing or skating outside at bowness park or a natural lake. Our favourite family hiking trail is either grassi lakes or grotto canyon. As our kids grow I can’t wait to do a summit. We had a great first day at Norquay - making memories for the first time all four of us were on the hill ! Looking forward to a family trip to Fernie this year. This is the first time commenting - but I am always inspired by your blog and is the first place I go to stir up ideas for family fun days ! We plan to home a lot this winter! Favourite hiking trail is in Exshaw (just out of Canmore). We use to live there. A lot of nice trails to explore right from town. Excited to take my daughter for her first time skiing this year! We have been really enjoying downhill skiing this year! It has been great to be able to ski in November! We also bought canmore nordic passes in case there was no snow this year - looking forward to a great season of skiing! Favourite hiking trail…this changes every year as our family changes, but the best from this year was Ptarmigan Cirque…the whole extended family. Snowy adventures…mostly cross-country skiing, probably one downhill, and lots of in-city walks. Favourite thing to do outside as a family: snowball fights!